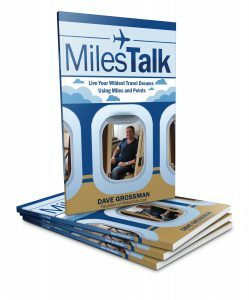 I don’t normally use an online travel agency. I’m somewhat obsessed with re-earning my Marriott hotel status and need all my night credits! But when you are booking a boutique non-chain hotels, that’s a perfect time to turn to sites like hotels.com and Orbitz for deals, usually in the form of discounts and coupons. Orbitz has a bit of an interesting one today. 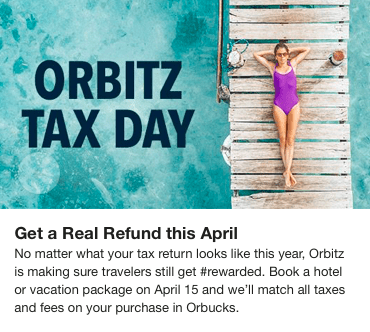 In “celebration” of tax day, if you book today they will rebate up to $250 in taxes and fees back to your Orbucks account for your next booking. It’s valid for hotel only or air+hotel packages (which, by the way, can be a solid deal compared to booking separately). Note that, sadly, it does not include rebating any fees you pay at the property, like resort fees. Best part? Ebates is offering 5% back at Orbitz today – so you can totally double dip for up to around 30% off.